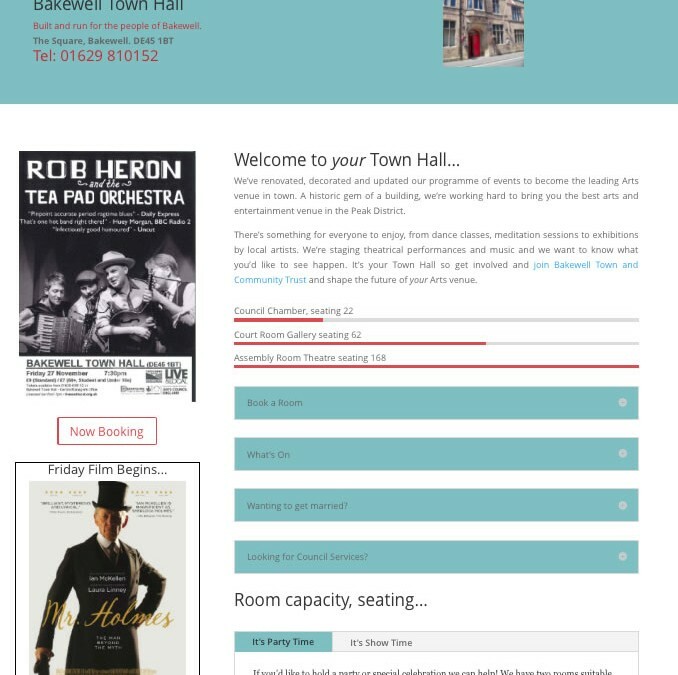 Having been asked to provide a website solution and necessary training for staff to manage in-house I proposed WordPress.org as a suitable platform for the website project for Bakewell Town Hall. Given the requirements for multiple-user management, together with future requirements for being able to integrate both room booking and event booking facility, made WordPress.org the perfect choice. Q – What factors made you want to develop your own website? A lack of funding and the need to be free of a developer charging large fees for making changes led us to choose the option presented by Susan at Website Wings. We recognised that our business is changing rapidly and we didn’t want to be faced with paying out large amounts for another new website in a few years’ time. Q – What were your emotions when you embarked on the training and learning process? To be honest, after the initial excitement at the prospect, I felt utterly lost and overwhelmed by what seemed the size of task ahead and my lack of knowledge. Up to that point I was just a user of websites – not a developer of them! The processes involved with planning a website, beyond what I ‘thought’ I wanted it to look like to understanding how to benefit the User were totally alien to me. Initially I felt very unconfident at considering I would be able to get my head around the task ahead of me. Q – Did you feel the training materials were personalized and delivered in a way that suited your preferred learning style? It was great, the learning materials were personally tailored not only to the business but to my level of understanding and even the situation I work in where I am constantly interrupted. The delivery method developed by Susan, having listened carefully to what I had to deal with on a day to day basis, allowed me to pick up the training content quickly, refreshing my mind on past points covered and so helping me get up to speed again really easily. Susan spent many hours talking with me and she got to know what would suit my work situation and level of technical ability. Q – At what point in the training process did you began to feel excited about what you were learning and being able to do yourself? When the training began and I started to play around with WordPress. It clicked really quickly and I was surprised how, with the way the training was delivered that my training site practice run became intuitive and familiar. It worked well for me because the training was delivered in easily digestible chunks, As a result I rarely had to refer back to the modules to refresh my memory. It went in and stayed there. Q – What have been the main benefits to you from training delivered to develop your own website on WordPress? I don’t feel overwhelmed by the thought of managing our website, now it’s actually ‘live’.. I feel confident that our business can respond quickly to change. I’ve realized how easy and quick it is to make necessary changes to our website and understand how we can refresh the look of the site when required. I like how WP is so flexible and has so many options – ideal when your business is developing. Q – Do you think the training and support you’ve received has helped build your confidence and self-esteem? Very much so. Without the training I could never have imagined attempting what has now been achieved. It has helped me develop the confidence to take the business forward, be more ambitious about our offer and create a vision for our future success. Q – From your experience, what would you say to someone who was considering the option of training with Susan to learn to use and manage WordPress confidently. Oh do it! At the end of it you’ll be in total control of your own site and future site development direction. It’s a skill you will carry with you, whatever your future throws at yo,. and it’s not anywhere near as scary as you think. Q – Do you think the costs involved represented value for money? Massively. Training with Susan has saved our business thousands of pounds in the long-run. Also, knowing future support is there, when we need it, is a huge weight off my mind.